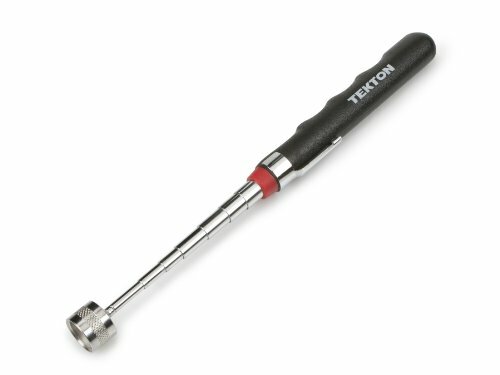 Need to reach a dropped screw or nail in a small or tight space, then the TEKTON 8-lb. Telescoping Magnetic Pickup Tool is the perfect tool for the job. Lift up to 8 pounds with the powerful built-in magnet. It features a chrome plated telescoping shaft that extends from 6-1/2 inches to 33 inches. A removable shielding collar prevents magnetic attractions to non-target objects. The handle is a non-slip, soft finger grip that makes the tool comfortable to use. Powerful magnet lifts up to 8 lb. Chrome plated shaft telescopes from 6-1/2 in. to 33 in.